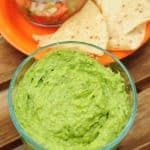 My secret ingredients in this guacamole are edamame and Greek Yogurt. An added bonus: This version packs about half the calories and three times the protein as regular guac! Place edamame in the bowl of a food processor and process to a paste, stopping to scrape down the sides as necessary. This should take less than a minute. Add yogurt, lime juice, garlic, red onion, cilantro, jalapeño, green onions, salt, pepper and olive oil to the food processor. Process to combine. Add more salt and pepper if needed, to taste. Serve immediately.